Hmmm, rapture huh? Guess I missed it. If there's an after party, I'll bring a green bean casserole. "jim trivelpiece aka kaido shasta abbey 72-73"
Jim, welcome to the Forum! I remember the time that you and Ann spent at the Abbey quite well. It is good to see you here! Yes, please copy my email. I just posted a group photo in my Gallery. As I recall, this was taken in about '75, just after the main gate was finished. Ann and I aren't in the photo- I think we were in Eugene caring for the Singers' kids. It would be interesting to see how many of the faces we can name. Jim, I hope you don't mind if I try to post it here also just in case some folks have difficulty navigating to the galleries (I need to write up something about that). Time for a roll call -- who are these folks? Jim, thank you for sharing it. The one on Engo's right (Engo's from Toronto - any news of him?) is Marty Baine, don't remember his ordination name. He married Rikuko (Catherine), who had been ordained by Roshi at Throssel. The two of them left Shasta, and came to Toronto, later divorced. Marty returned to the States, became an MD - am not sure what happened after. Rikuko is not in the picture - if you remember her, she became a Tibetan Buddhist later and lives in Halifax. The picture was probably taken after I left. When I left, Kinzan had not been transmitted yet, I believe. So 1975 seems to be correct. Thank you, Jim!!! Photos are such fun. The monk between Kyogen and Haryo is Kyosei (I think). Koten wasn't at the Abbey that early. I think the one to the left of Kinzan is Hofuku...but he could tell you. Was Kyosei, aka Barbara Berman, married to Bino (Bob Springer)? No, Kyosei was Karen Hughes, married to Hofuku, aka Mike or Chisan, on these forums...unless I'm completely confused, in which case I apologise. I don't completely trust my memory after all these years. Me neither LOL. Hopefully someone else can say for sure. Jim, thanks for posting this! I agree with you and Ol'ga that this photo was taken in 1975. Isan, I agree with all of your name-person links, except for the monk you identify as Koten, who was not ordained until 1978. I think that the first unidentified monk in the second row, as Jimyo says, is Hofuku, now Chisan Michael Hughs. 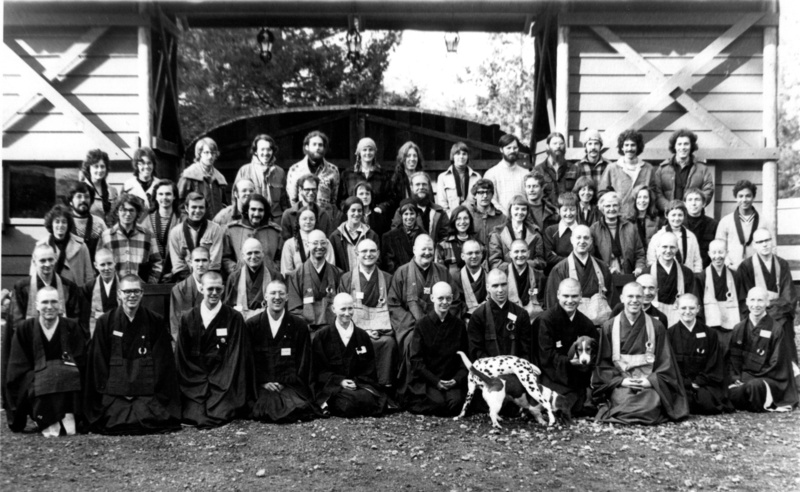 The lay person in the third row on the (our view) far right, is Albert Fuller, ordained sometime shortly after this photo as Myogetsu. The lay person to his right, Mary Czerniski, was ordained not long after as Kaikan. Also, quite an interesting tangle of dogs here in the front! Barbara's name was Kotei. I don't see her in the photo. She and Bino left before me, and had a baby. I don't know if they came back. Mark may know more. They were mentioned somewhere on this forum. Perhaps all this could be in the Keeping in Touch topic. Yes, I think Marty was Echu. As to the dogs, the Dalmatian might be Sam (Psychadelic Sam, a very neurotic dog), but possibly not - Sam was big and fat. He used to overfeed at the compost pile, and then park his bisquit on the library rug. I used to be the librarian at that time - I had my work cut out for me. The dog in Engo's lap seems to be Dog, a beagle-basset (?). Dog lived for one activity only: dropping pinecones at your feet - you threw them and he fetched them. Mokurai, or someone, drove Dog mad by burying the pinecone in a snow pile, and sitting on it. Dog barked until Mokurai gave in. Ah, Kotei, that's right. The first monk in the first row I'm pretty sure was from Canada, but I can't remember his name. In the first row of lay people and directly behind Gyozan is Zuiko (Chosei's wife). I'm not remembering her "lay" name. She lived at the Dell most of the time and taught school there. Ah yes, Psychedelic Sam! He also had a thing for chocolate. On one of the ceremony days he downed a bowl of brownie batter. Then, when we were out on procession he ralfed on my section of the tan. Even after a quick clean-up, my bows were off-center for quite some time. I thought Dutchess was also Dalmatian, but I may be wrong. Echu=Marty took care of the goats, very professionally. He insisted that the goats be dehorned, but Roshi wouldn't allow it. As a consequence, Becky the goat got gored by one of the goats with horns. I think it was one of the main reasons why Marty left. Roshi really was such a banned term. This will probably not get by the censors (it didn't). So, banned term!! Jim, I agree with Ol'ga that Dutchess was a Dalmation. Because Dog and Sam were bitter rivals, and because the Dalmation in the photo looks significantly smaller than Sam, I think we might be looking at Dutchess. Also, because Dog was so lean (chasing all those pinecones, stones, and balls! ), I think that he might be in Engo's lap, and one of his stockier offspring may be who we see under Dutchess. You are certainly right about Sam's love of all things sweet (or, perhaps I should say, his love of anything edible--and anything that might once have been edible)! There was also the time when he ate most of the contents of a large box of maple bars, donated to us by a bakery, after the box had been left briefly unattended in the back of Keitetsu's car! My notes on the back of the photo say the dogs are Duchess, Dog and Wench.